Beginning something new means stepping out of your comfort zone. It might be a small step, but it might be an immeasurable leap. Beginning this blog is an immeasurable leap for me. October 2013, I had flown across America to SFO airport where one of the most beautiful people I have ever had the pleasure of knowing, picked me up. With a hand-drawn sign that simply said “CHAN,” I knew everything was going to be fantastic for the next ten days. Little did I know, the lovely Margaret had an evil plan in store for me. She and I share an appreciation for the outdoors, exercise, and exploration, so it was unsurprising that the itinerary was overflowing with hikes, walks, and trips to parks and natural geographic features scattered along the Pacific Coast. 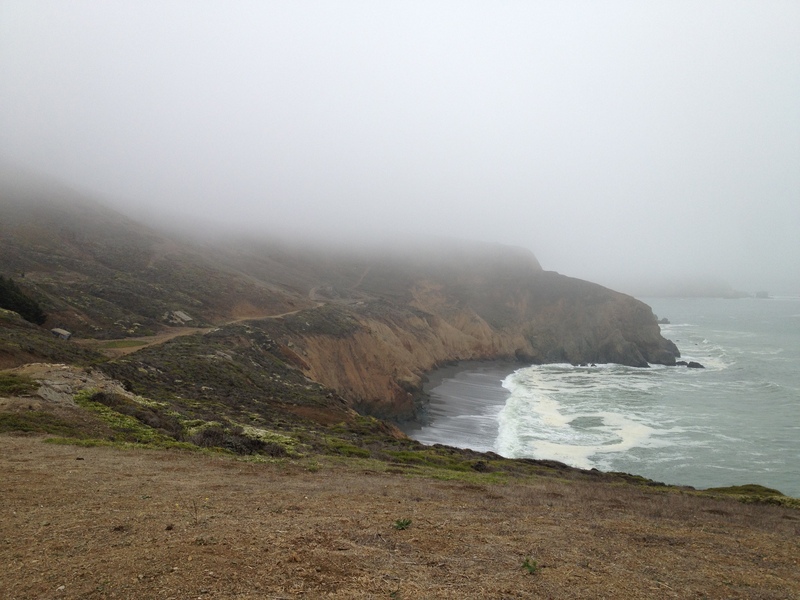 Before the first hike at Mori Point in Pacifica, I reminded her of my fear of heights. She laughed it off, thinking that I was exaggerating. Years prior to this trip, I had been ill for a short while. Barely showing weakness or despair, those around me began to think that I was a sort of Wonder Woman. Except, we all knew I couldn’t pull off those high-waist hot pants! Situations like these teach you to keep a calm and composed exterior, regardless of the tempest brewing just under your skin. So, we arrived at the park. It’s beautiful! 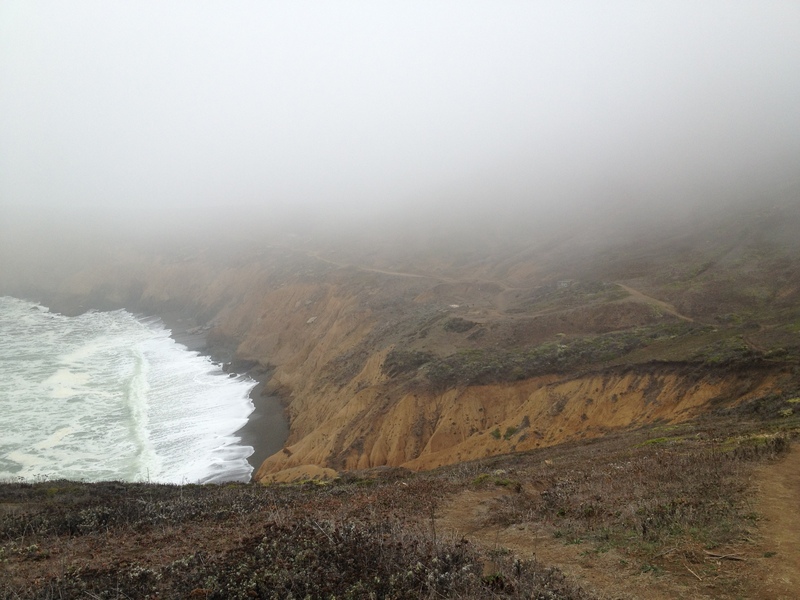 In the fog the paths, rolling hills, cliffs, and shoreline all bore an eerie overtone. I should have known what was to come. I snapped photos of the succulents, rocks, dedicated benches, and enormous black birds. Then, Margaret led me up a burnt umber dirt path freckled with rocks and pebbles. The ocean was crashing against the coast just to our left, and that was when I realized that mere inches away from me was, what looks to me like the edge of the world. My chest seized up, my legs locked in an uncomfortable crouching position, sweat poured from my body, and I welled up with tears—I was having a panic attack. I felt for a big rock, and sat, holding on to that for a few minutes while Margaret talked me down from the attack. The coldness and mass of the rock was more reassuring than I could ever express. We didn’t turn around at that point only because I was convinced attempting to get back down that rocky, dusty path would lead to certain death. Margaret felt badly about underestimating my fear, but was ready and willing to hold my hand through the rest of the climb and hike. Up and down we went, over the hills, out onto the cliffs, trying to find the Pacific Ocean somewhere in the fog, and eventually I came out of it for the better. One of my best friends and I made it through, truly experiencing the beauty and splendor of Mori Point. She is a big part of why I am able to begin this writing journey, writing about—what oftentimes seems to me as insignificant and unsubstantial—my thoughts, journeys, and experiences and how they are helping this 27-year-old girl become a better woman. You are the strongest person I know. I cherish all the time we have spent together, especially over that visit, and I look forward to even more opportunities in the future to overcome our fears and become better people together.